Human beings have 33 separate vertebrae that make up the spinal column. The rib cage, with the lower thoracic vertebrae visible at the bottom. Vertebrae connect to form the back's spinal cord. The tailbone, or coccyx, is the lowest segment of the spinal column. The individual vertebrae protect and support the spinal cord. 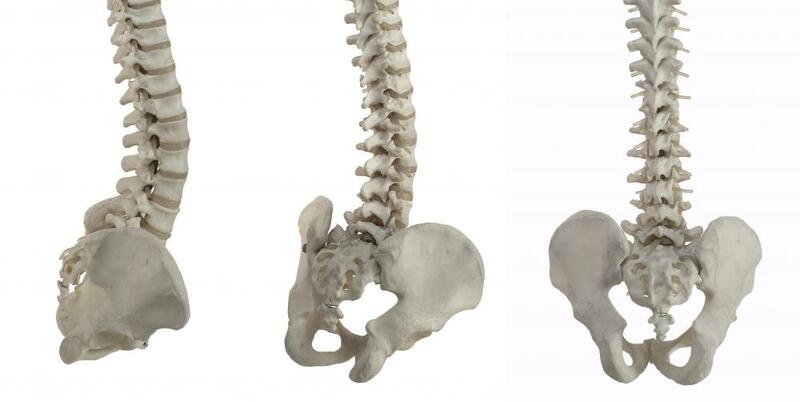 The lumbar area contains the largest vertebrae, which help support body weight. 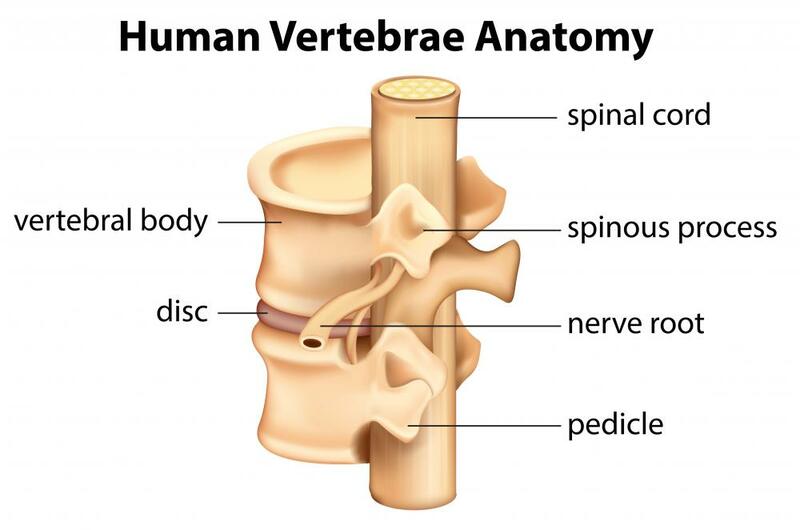 Vertebrae are the highly specialized bones which collectively make up the spinal column. The spinal column is such a distinctive anatomical feature that all animals with spinal columns are known as vertebrates, referencing the vertebrae. In humans, 33 separate bones make up the spinal column, and the structure begins to form around the third week of gestation. The spinal column serves a number of important functions. 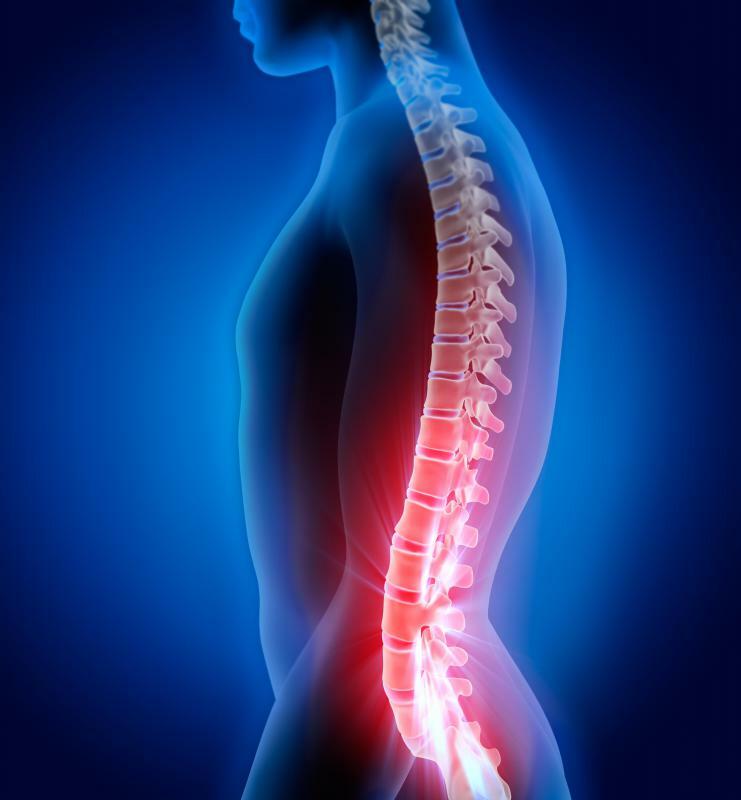 The individual vertebrae protect and support the spinal cord, which connects the brain and the rest of the nervous system. The bones also create attachment points for muscles and other bones, allowing for flexible movement in a range of directions. Finally, the spinal column provides critical support to the animal, and in the case of humans and apes, these bones allow the body to walk upright. There are several different types of vertebrae, classified by their position. Cervical vertebrae form the upper part of the spinal column, with two special cervical vertebrae, the atlas and the axis, connecting the spine to the skull. 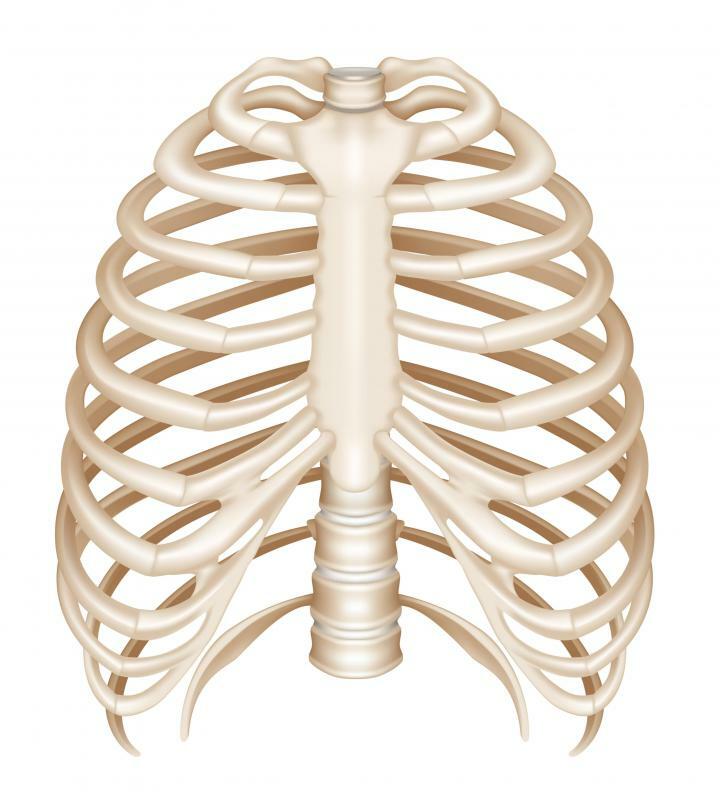 Next come the thoracic vertebrae, which include points of attachment for the ribs, followed by the lumbar spine, which includes the broadest and largest bones to support the body weight. The sacral and caudal vertebrae follow, and in humans, these are fused into structures known as the sacrum and tailbone, respectively. While the precise configuration of bones in different parts of the spinal column varies, each has a large area known as the body or centrum, with a number of processes attached. The processes protrude from the back of the centrum, providing attachment points for muscle and creating a hollow space for the spinal cord. The distinctive bumps which many people can feel at the backs of their spines are created by the spinous process. Each of the bones is articulated so that it can move with the bones around it while ensuring that the spinal cord remains protected. 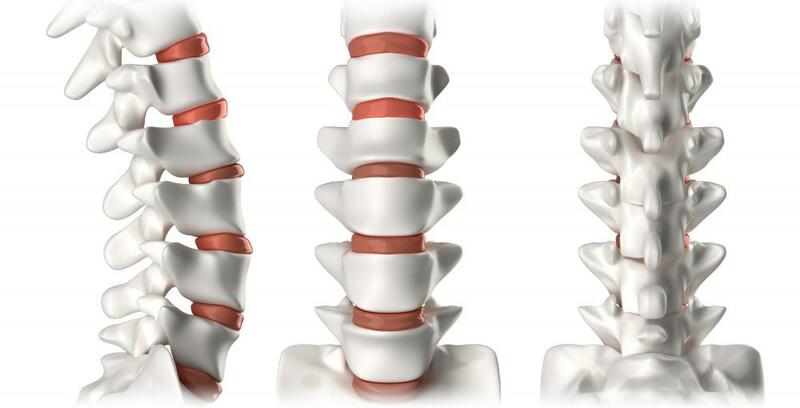 Between each vertebra and its partner is a disc of spongy material which is used as a shock absorber. Over time, these discs can become worn and compressed, causing back pain and restricting freedom of movement. This can also lead to compression of the spinal cord, in cases where the damaged discs bulge out and put pressure on the spinal canal, and this can cause serious neurological problems. A number of other issues can interfere with the functions of the spine, including fractures, which can be extremely dangerous if the spinal cord is severed or damaged. What is an Atlas of Anatomy? What are the Lumbar Vertebrae? What is the Iliolumbar Ligament? What is a Vertebrae Model? It is understandable why so much money is directed toward the chiropractic industry: the wellness of the backbone has a lot to do with the wellness of a person. Spinal damage can cause neurological problems, excessive physical pain, and difficulty in sleeping. It is necessary to have things "straightened out" if one wants to live a strong and happy life. Animals are separated into two categories based on whether or not they have this central structure: Vertebrates and Invertebrates. Animals without vertebrae are almost always dependent upon an exoskeleton to hold them together. Vertebrates are held together primarily by their internal skeletal structure, which is held together by the vertebrae. The bodily function, fluids, and systems, are dramatically different for animals with and without a backbone.